On South Padre Island’s broad beaches|! !| it’s all about the sun|! !| sand|! !| and surf. Enjoy kiteboarding|! !| surfing|! !| kayaking|! !| or just soaking up rays. It’s not that the Texas Coast is my best friend. It’s several best friends, each with her own Gulf of Mexico personality. I hang out with each, depending on what I’m in the mood for: sailing, shopping, fishing or just walking the shoreline, feeling the waves tickle my feet. Regardless, I know I’ll sink into some serious relaxation and dive into dining. Come with me. The San Luis Resort, with its spa, fitness center, restaurants and pool with swim-up bars, has long been a seaside star, but its five-suite enclave Villas at the San Luis (5222 Seawall Blvd., villasatsanluisresort.com), tucked at the edge of hotel, takes pampering to a new level in these graceful, 800-square-foot hideaways with a private pool, bar and staff. Fishing’s the big lure. Whether you’re on a boat in the Gulf or bay, parked on a pier, jutting out on a jetty or casting a line into the surf from the sand (you can drive and park on this beach), Port A and Rockport are your spots for tarpon, pompano, sea trout and more. Birders flock to Aransas National Wildlife Refuge north of Rockport (fws.gov/refuge/aransas). Hunters stalk south to King Ranch (king-ranch.com) seeking deer, turkey, quail, and feral hogs. Everyone loves beachcombing on serene, undeveloped Padre National Seashore (20420 Park Road 22, nps.gov/pais). Dock yourself in a deftly decorated beach house at Cinnamon Shore (500 Texas 361, cinnamonshore.com) near Port Aransas with two pools, restaurants and a stocked lake for fishing. 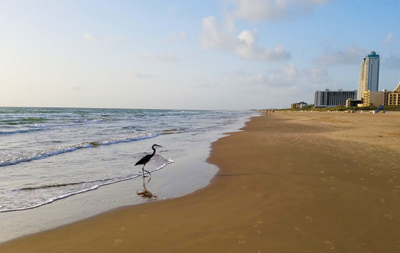 South Padre Island’s all about the wind and the waves: sailing, surfing, windsurfing, kiteboarding, parasailing, even skydiving right onto the beach. You’ll want to book a condo or beach house. Franke Realty (frankerealty.com) handles luxury accommodations on the quiet, north end of the island. Enjoy a massage with clam shells at Sapphire Spa (310A Padre Blvd, spisapphire.com), then hop aboard a sunset cruise (sailspi.com) with a chef grilling shrimp as you cruise gently down the bay. Watch the sun set over the bay with a margarita and ceviche at the Painted Marlin Grille (202 W. Whiting St., paintedmarlingrille.com). Don’t let the gulls steal your food. In Rockport, piers jutting into Aransas Bay define the mid-coast’s primary passion: fishing. Cast a line for a sea trout or hop on a deep-sea boat for tarpon. Rudy & Paco Restaurant and Bar (2028 Post Office St., rudyandpaco.com) offers possibly the best fine dining on the Texas coast, whether you want steak or seafood (plantain-crusted snapper). Enjoy seafood Italian style (scallop risotto) at Riondo’s Ristorante (2328 Strand Ave., riondos.com). Brunch on oysters benedict at Sunflower Bakery & Café (512 14th St., thesunflowerbakeryandcafe.com). Water Street Seafood Company (309 N. Water St., waterstmarketcc.com) has those raw oysters you crave, as well as mesquite-grilled fish. Tex-Mex and seafood marry marvelously (crab enchiladas) at unfancy, but fun La Playa (222 Beach St., Port Aransas). You’ll find fine dining with good wines and excellent pasta at Gabriella’s (700 Padre Blvd., gabriellas.com). Blackbeards’ (103 E. Saturn St., blackbeardsspi.com) will cook your catch or fill you (huge portions) with with grilled mahi mahi, huge fried shrimp and more. Watch dolphins dance, giggle at otters, then pet a jellyfish at Texas State Aquarium (2710 N. Shoreline Blvd, texasstateaquarium.org). Right next door, explore life on a World War II aircraft carrier with a tour of the USS Lexington (2419 N. Shoreline Blvd, usslexington.com). Schlitterbahn waterparks make a big splash in three Texas beach locations, with lazy rivers (not so lazy as all that; rapids will spin you and sprayers will soak you) as well as tons of pools and tube slides. Covered sections of South Padre’s and Galveston’s Schlitterbahns are open year-round on weekends. South Padre Island and Corpus Christi’s parks include hotels; the Corpus one has a golf course.